I have two Native American dolls inherited from my brother-in-law. They have soft bodies made of some sort of brown fiber almost like burlap. The bodies are hand stitched and the clothing is machine stitched. They both have black hats on with capes around the neck that goes down past where their elbows should be - they don't have any arms. Their "legs" are 1 round tube with a flat bottom. They have skirts to cover up this "tube". The bigger one 8" tall has a very elaborate skirt with many small pieces of fabric sewn together in a pattern of diamonds and stripes. She has 4 strands of beads, 2 red and 2 green, around her neck with beaded earrings. The little one 4 1/2" tall has 4 strands of beads, 2 white and 2 red, around her neck, no earrings, and her skirt is plain with 3 different stripes. 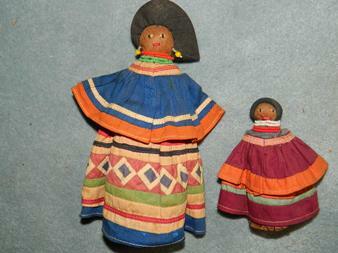 The dolls are Seminole and made from dried palm leaves, not burlap. Identifying these Native American dolls. Hello. I believe these dolls are made by the Seminole tribe of Florida. I'm not sure of their age. But maybe this information can start you on the right track.